I came back for a second round in my quest to find out if it is possible to make restaurant level tonkotsu (pork bone broth) ramen at home. Now that I had been through the process once, my objective this time was to correct some of the mistakes I had made, as well try to start streamlining the operation somewhat. This is what happens when former operations strategy consultants are left unsupervised in the kitchen. This time, I decided to forgo the hanjuku (half-cooked) egg and mayu (black garlic oil) toppings. While I like both, they add a bit of time and labor to the schedule and their removal does not dramatically affect the composition of the finished bowl. This time, I used a pork shoulder (picnic) slab that had a bit more fat than the previous. 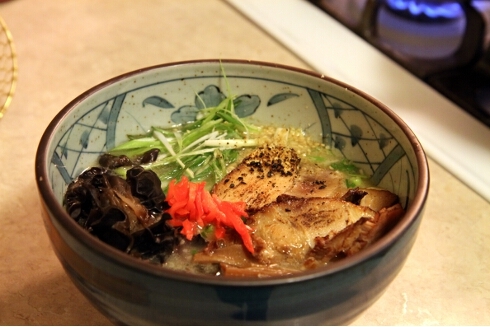 (In case anyone wasn’t clear, despite its deliciousness ramen is not the healthiest thing you could choose to eat.) 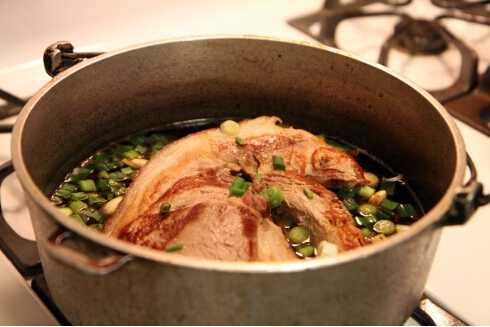 But what made an even greater impact was switching from stove top simmering to placing the covered pot into the oven after searing the meat and adding the braising liquid. 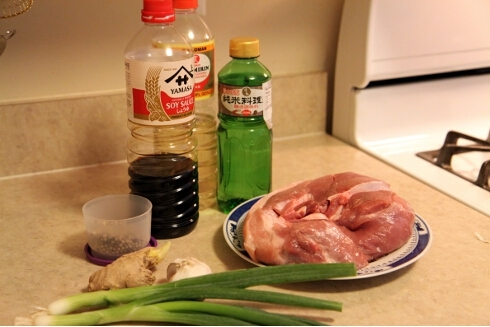 This resulted in a far more tender and juicy chashu topping. 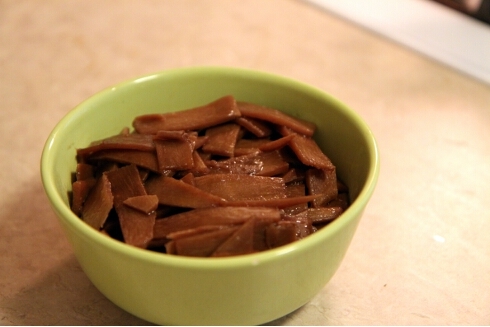 I didn’t have time to go to Mitsuwa Marketplace to pickup menma, seasoned bamboo shoots. I made my own, instead. 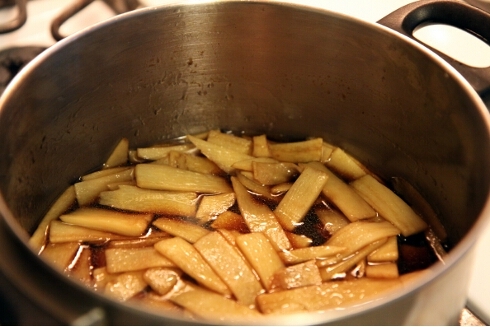 After sauteing in sesame oil, simmer bamboo in soy sauce, mirin and cooking sake. Finished menma. This turned out a bit more salty than I had wanted. 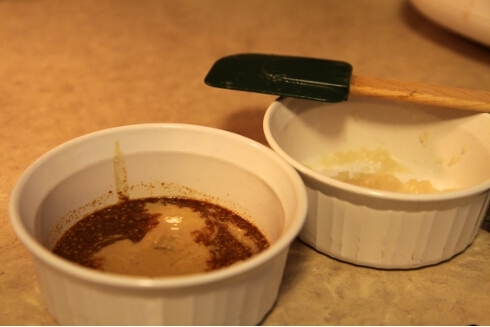 Next time, I’ll use less soy sauce and drain the residual liquid off once the cooking is done. 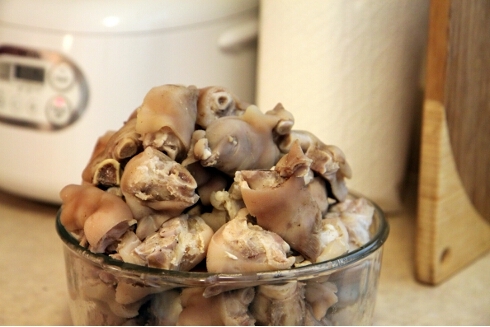 Cleaned pork leg bones and feet. Added the same stock flavorings as last time, but wanted to do better on the execution. 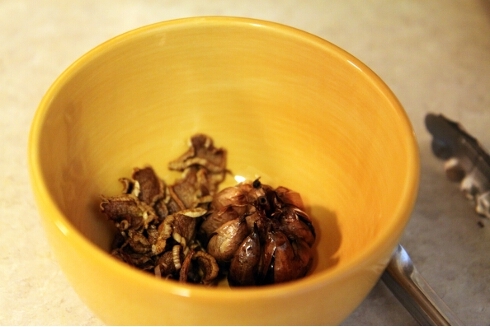 This time, the ginger slices and garlic head were actually caramelized, instead of carbonized. Looking for similar results with the onion. 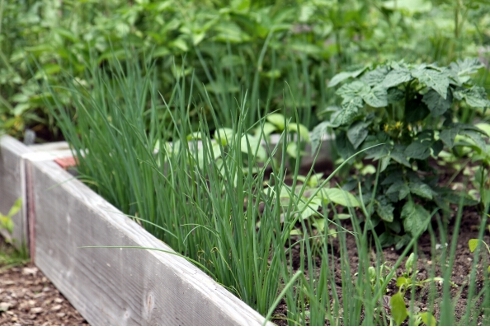 A quick trip to Baba’s plot in our community garden, to pick fresh negi (green onion). 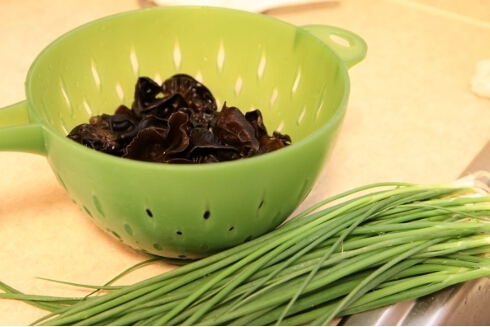 Kikurage (wood ear mushroom) and negi make return appearances in the bowl. 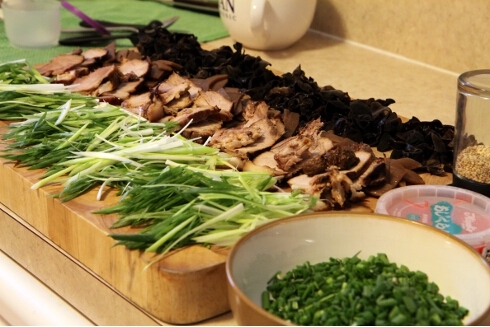 The two, particularly the green onion, are almost required tonkotsu ramen toppings. 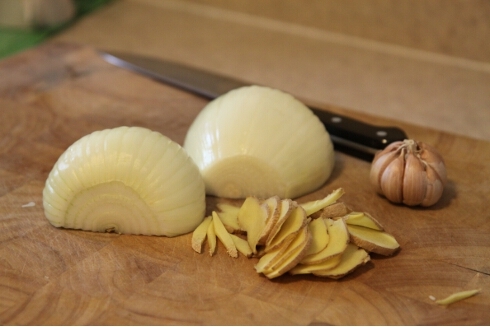 The toppings stage. 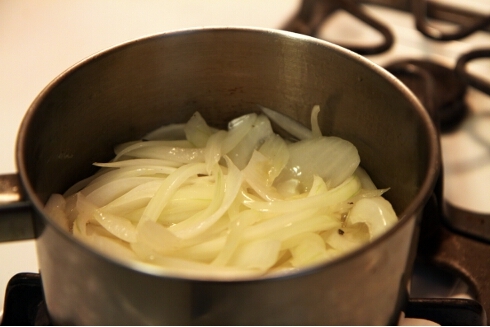 Again, I will use the ground sesame seeds and benishoga (pickled ginger). 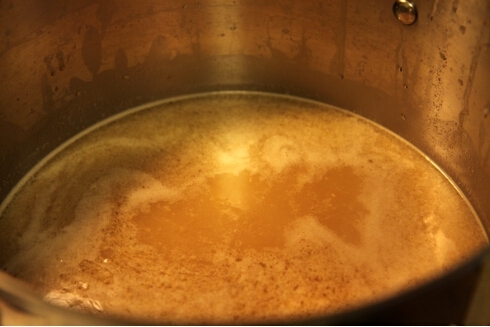 The soup this time was a golden color, as opposed to the cappuccino hue of the first batch. I’m chalking this up to having not charred the flavorings beyond recognition. 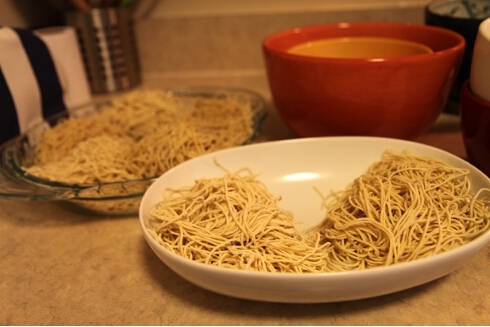 I wasn’t impressed by the Sun Noodle strands I used last time. 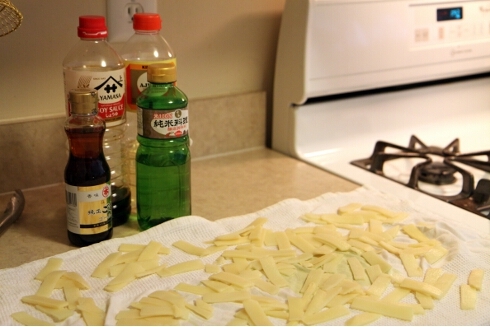 This time I experimented with noodles from the Yamachan label. Yamachan’s noodles in the US are made by Nippon Trends Food Service in San Jose, CA. Nippon also happens to be the supplier to many top-level ramenya in the US, including Minca and Kambi, my goto ramen joints in New York. I’m sure all of those shops have their noodles made to custom order, the specifications of which are as heavily guarded as the Colonel’s secret recipe, but I was hoping some of the pedigree of those shops might rub off onto the store packaged variety. Similar soup additions as before. 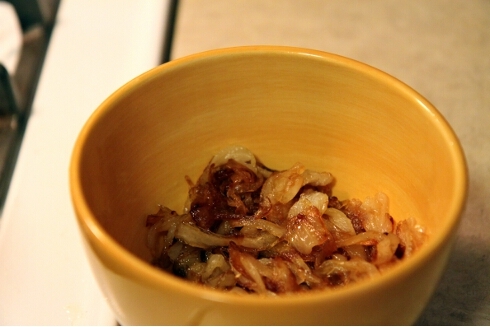 The only difference was that I sliced off the hard rind on the pork back fat before spinning in a food processor. 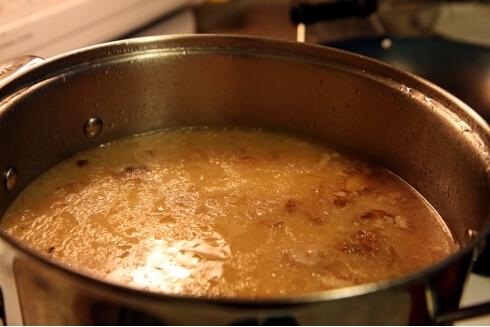 The result was that the bits of fat actually emulsified with the soup, instead of floating on top. The final soup definitely had a different flavor this time. It was also creamier, thanks to the back fat, though still not to the level of high-test tonkotsu. I’ll have to block out the thoughts of how bad this stuff is for my cholesterol level and just go for the gusto in the future. The finished bowl. This time, I finished off the chashu with a bit of blowtorch administered char, as some restaurants do. Previous postClearing the Way Next postWhat’s the big idea? thanks! 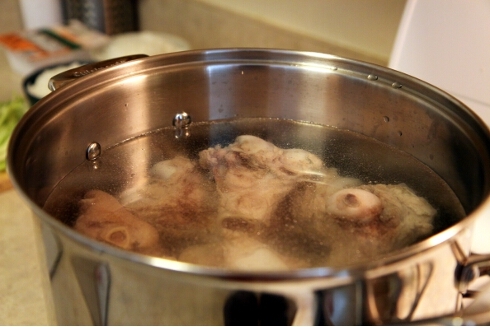 I was ordered to make another batch soon, as the pork bones are occupying too much space in the freezer.